This data set contains 144 data files in LiDAR .laz file format and one file in ESRI Shapefile format providing the tile footprints. 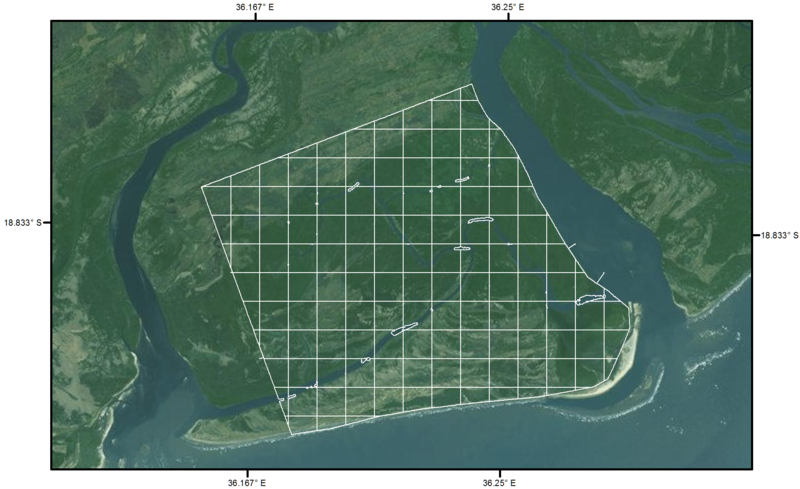 This data set provides high-resolution LiDAR point cloud data collected during surveys over mangrove forested land in the Zambezi River Delta in Mozambique in May 2014. The data are arranged into 144 1- by 1-km tiles. This data collection was funded through CMS Project grant number 14-CMS14-0028. There are 144 compressed LiDAR point cloud (LAZ; *.laz) data files and one ESRI Shapefile (*.shp) included in this data set. The shapefile has four files provided in a zipped folder (ZambeziDeltaTiles.zip) and contains the footprint of each LAZ file as a feature record identified by the "FILE" attribute. The spatial reference properties for the data files are listed below. The shapefile is also provided as a companion file in KMZ (*.kmz) format for viewing in Google Earth. This data set provides the basis for aboveground biomass estimates of tall mangrove forests in the Zambezi Delta, Mozambique. Mangroves are ecologically and economically important forested wetlands with the highest carbon density of all terrestrial ecosystems. Because of their large carbon stocks and importance as a coastal buffer, their protection and restoration has been proposed as effective mitigation strategy for climate change and coastline loss. No uncertainty estimates are provided with this data set. The Zambezi River sheds water from a 1,570,000 km2 area encompassing eight African countries and eventually discharges into the Indian Ocean via the Zambezi Delta. The wet season occurs from April to October with approximately 1,000 to 1,400 mm annual rainfall. To compare, enhance, and validate spaceborne-based assessments, airborne LiDAR data were acquired 5 May 2014 by Land Resources International (Pietermaritzburg, South Africa). The airborne survey comprised an approximate area of 115 km2 in the Zambezi Delta region, Mozambique, with a point density that ranged between 5 and 7 points per m2 (Lagomasino et al., 2016). The data were processed in Global Mapper and arranged into 144 1-km2 tiles for distribution with this data package. Canopy height models and biomass estimates generated using the point cloud data are available in the related data sets listed above in the Data Set Overview section.